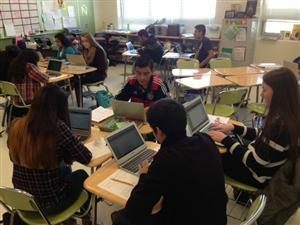 This school year is Wakefield’s second year of participating in APS’s Personalized Devices Initiative. In late September, freshmen were issued a MacBook Air, and along with sophomores, now enjoy the privilege of taking the device home and use for academic purposes. At Wakefield we feel that the best instructional value from the devices will happen if the devices are sent home. These are the skills needed for success in college and careers in the 21st Century and APS is proud to offer students these high-quality learning experiences to prepare our students for their lives beyond high school.